Nicholas I, Tsar of Russia from 1825 to 1855; born 25 June 1796, son of Tsar Paul I and Maria Feodorovna. He was the younger brother of Alexander I, whom he succeeded in 1825. Nicholas married Charlotte of Prussia (1798-1860) who became known as Alexandra Feodorovna. 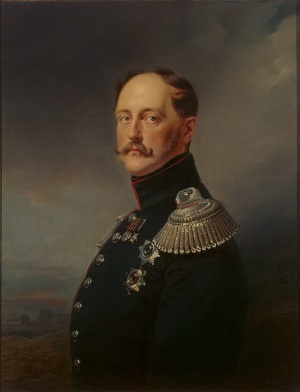 Nicholas died 18 February 1855 and was succeeded by his son Alexander II. Nicholas was benevolent to the Mennonites. In 1835 he gave the immigrant Prussian Mennonites under Wilhelm Lange permission to settle 40 families from Brenkenhoffswalde, although he had previously forbidden any new immigration, and on 31 December 1854, he gave an interesting document of praise to the Molotschna Mennonites for their part in the Crimean War in gifts of money and the care of the wounded and sick. To Johann Cornies, the great promoter of agriculture, he showed appreciation. He was therefore held in high esteem by the Mennonites of Russia. Friesen, Peter M. Die Alt-Evangelische Mennonitische Brüderschaft in Russland (1789-1910) im Rahmen der mennonitischen Gesamtgeschichte. Halbstadt: Verlagsgesellschaft "Raduga", 1911: 80, 488. Hege, Christian and Christian Neff. Mennonitisches Lexikon, 4 vols. Frankfurt & Weierhof: Hege; Karlsruhe: Schneider, 1913-1967: v. III, 255. Neff, Christian and Richard D. Thiessen. "Nicholas I, Emperor of Russia (1796-1855)." Global Anabaptist Mennonite Encyclopedia Online. December 2007. Web. 19 Apr 2019. http://gameo.org/index.php?title=Nicholas_I,_Emperor_of_Russia_(1796-1855)&oldid=111601. Neff, Christian and Richard D. Thiessen. (December 2007). Nicholas I, Emperor of Russia (1796-1855). Global Anabaptist Mennonite Encyclopedia Online. Retrieved 19 April 2019, from http://gameo.org/index.php?title=Nicholas_I,_Emperor_of_Russia_(1796-1855)&oldid=111601. Adapted by permission of Herald Press, Harrisonburg, Virginia, from Mennonite Encyclopedia, Vol. 3, p. 869. All rights reserved. This page was last modified on 23 January 2014, at 06:01.